Totally! 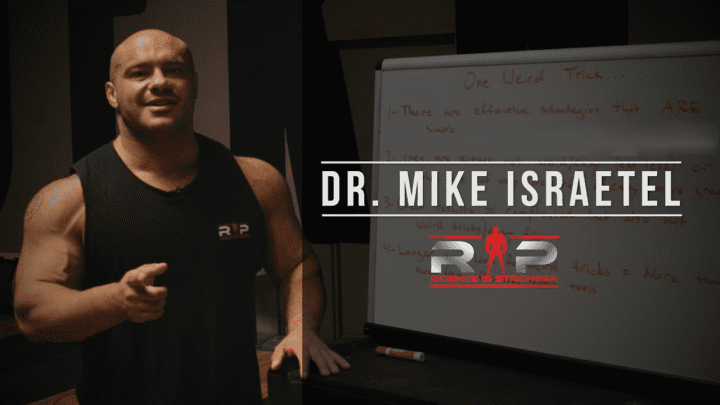 My name is Mike Israetel and I’m the Head Science Consultant for and Co-Founder of Renaissance Periodization (@rpstrength on IG). I got my PhD in Sport Physiology 4 years ago, and I’ve been a professor for the last 4 years, teaching courses in sports nutrition, strength and conditioning, health behaviour, and everything sport and exercise science related. On the personal front, I’m a competitive bodybuilder and Jiu Jitsu grappler. What aspects of nutrition do you believe people should be prioritising when looking to gain muscle? Eating enough calories is for sure point #1. In order to gain muscle at the best rates, a surplus of 250 to 500 calories a day is very likely to be a necessary feature. After that, getting enough daily protein is a very good idea, with a gram per pound of bodyweight per day a rough guideline, such that a 150lb individual looking to gain muscle should probably get in about 150g of protein per day. Lastly (for this short question) getting that protein in over 4-6 evenly spaced meals per day is a big help, because that strategy results in muscle tissue having a constant supply of materials for growth, vs. having to wait to grow for long intervals if fewer meals per day are taken in. Oh and bonus points; consistency… if you don’t apply these approaches on a regular basis, you’ll find yourself without a lot of muscle to account for. Assuming protein intake is optimal, does it make any noticeable difference to results if somebody is consuming a high fat diet compared to a high carb diet while trying to build mass? Is the middle ground between the two options as effective? Probably. First of all, carbs supply energy for training and recovery like fats don’t. Secondly, Carbs lead to insulin secretion while fats don’t. This means that carb consumption triggers anabolism in muscle as well as fat tissue, but that fat consumption likely (when in excess) mostly triggers anabolism in fat tissue and not muscle. Lastly, having a high intake of carbs is both anti-catabolic and (through glycogen storage-mediated signalling pathways, for example), directly signalling to anabolic mechanisms unlike fat. Sounds like a lot, but all of these effects don’t add up to much… but not much is still something, especially over the long term. What does that translate into as far as practical recommendations? Probably getting in the minimum or just above of fat intake per day (0.3g per pound per day), getting the optimal protein (1g per pound), and then the rest of calories from carbs if you want to grow. What are your top nutrition tips for those looking to lose fat while maintaining as much muscle as possible? Don’t cut too fast! Losing between 0.5 and 1.0% of bodyweight per week, and only doing that for a maximum of 12 weeks before breaking for 8 weeks or more until the next fat loss phase starts can reduce the risk of muscle loss. Consume evenly-spaced protein meals throughout the day, and keep your carbs as high as you can for anti-catabolic benefits and the fuel to keep training hard. Is timing your protein intake important? Are there benefits to distributing it in a certain way? Depends on what we mean by “important.” Is it as important as calories or macros per day? No way. But it might be important enough to matter quite a bit in the long term. Because your body doesn’t have a storage form of protein like it has for carbs (glycogen) or fats (adipose tissue), it might be a good idea to take protein in around the clock. Now of course protein takes time to digest, especially when eaten with other food. So you don’t have to eat it every 2 hours or something. But once every 3-6 hours is probably a good idea. If there is a difference related to the distribution of protein, would that effect the results of somebody who was intermittently fasting? Absolutely. Intermittent fasting is a great way to diet if it fits your preferences, but it’s not optimal for conserving muscle size. However, just by introducing a casein shake or two (protein only) to the fast, one can save a lot more muscle and still have the big meals at the end of the day that they like! Research suggests that within three years of finishing a diet, 95 percent of people regain all or more of the weight they’ve lost. Do you have advice for people looking to be in the 5% that maintain their weight-loss? For sure. A big part is not doing a fad or crash diet. A diet should teach you basic and sustainable healthy eating practices as you do it. If you just come off a diet and go back to “normal,” you’ll just look like you did when you ate “normally” all those years (not great). Another thing is to have a commitment to fitness. Keeping weight off means you will ALWAYS have to keep up with SOME exercise and SOME organized dieting. There’s nowhere in weight loss where you “cure” being overfat… it’s a treatment that is easy to maintain after the weight is lost, but it’s gotta be maintained for good to keep bodyfat at bay. Do you have an opinion on whether mini-cuts (referring to 2-6-week cuts) are effective? Or do you believe longer bulk and cut cycles would be more beneficial for most? SUPER effective for re-sensitizing the body to gaining more muscle. But if long-term cutting is the goal, I think longer and slower cuts (8-12 weeks) are best. For sure. For anyone reading this, please take my answers as my “best educated guesses” and not “FOR SURE THE TRUTH.” In science, certainty is not in the cards and an open mind is the big ticket to wisdom. Also, thanks for having me on!!! !